Five people were killed, including a seven-month-old baby and a Belgian woman, and 53 injured when a tour bus plummeted off a hillside in northern Thailand after its brakes failed, according to police. Passengers said the coach had swerved several times on winding mountain roads, before it ploughed through a fence and down a steep ravine, according to police in Phitsanulok province, 380km from Bangkok. “Five people were killed including one woman from Belgium and a seven-month-old baby boy,” district police captain Sane Promrut told AFP. He said the bus, which had been travelling from north-eastern Udonthani province to the northern city of Chiang Mai, plunged about 20m in the crash early this morning. Police said the Belgian woman was in her early 20s. Hospital staff said the mother of the baby was in a critical condition, with internal bleeding, while the child’s father had suffered broken legs. A 30-year-old Belgian man and a Japanese man were also among the injured. 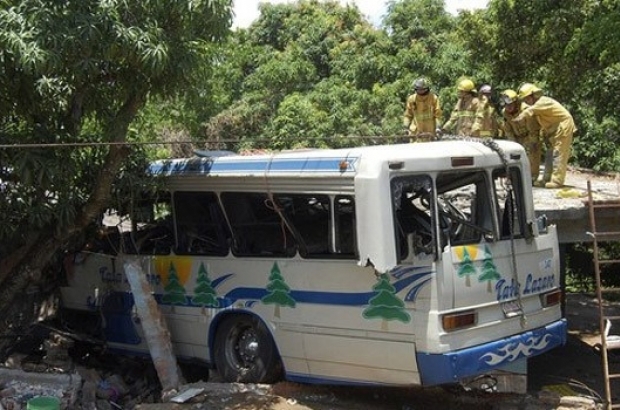 “The bus had problems with its brakes and was speeding before it crashed over the cliff,” Sane said, adding that passengers had smelled burning and the driver, who is also in a critical condition, had stopped to try and fix the problem before the crash.